The road to the Memorial Cup begins every season with 60 teams across Canada and the United States asking themselves if they have what it takes to win it all. As the season progresses, some of these teams are brought to the realization that it just isn’t their year while others continue through with high hopes. When the playoffs begin in late March, some teams are left on the outside looking in, while others go head-to-head fighting to claim the big prize. By mid-May, everything is set in stone, the OHL, QMJHL, and WHL Champions advance along with the host team to battle for the Memorial Cup. It is time to take a look at how Ottawa’s current crop of CHL skaters are fairing out during this extremely exciting season in the Canadian Hockey League. Ottawa’s blue chip prospect who came over in the Jason Spezza deal this past summer had a tremendous season with the OHL’s North Bay Battalion. The 6-3, 200 lb winger led all Battalion skaters with 37 goals while finishing 2nd in team scoring with 66 points despite missing a handful of games. Those games were missed due to Paul representing Team Canada at the 2014 World Junior Championships where he helped Canada claim Gold while posting 3 goals in 7 games. The Mississauga, Ontario native has tremendous size and solid skating ability, along with a scoring touch that could potentially put him in a top 6 role in the NHL when the time comes. Paul currently has 2 goals and 3 assists in 2 playoff games as the Battalion lead the Kingston Frontenacs 2-0 in their best-of-seven 1st round series. 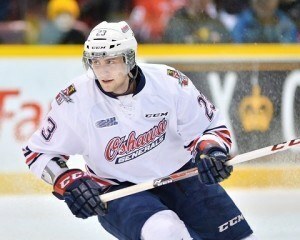 19-year-old Tobias Lindberg did what he was expected to do in his first OHL campaign with the Oshawa Generals. He finished the regular season 20th overall in OHL scoring with 31 goals and 77 points in 66 games played. The 6-3, 210 lb Stockholm, Sweden native is a solid two-way forward who has excellent puck protection skills, works hard each shift and has a NHL caliber shot. He recently had a 1st period natural hat trick in Game 1 of Oshawa’s 1st round series against the Peterborough Petes where the Generals won 7-2. The four-year OHL standout set career highs in goals (5), assists (26), and points (31) during the 2014-15 season. Listed at 6-6, 220 lbs, the hulking blue-liner finished 2nd in Barrie Colts defenseman scoring after coming over from the Guelph Storm at the OHL Trade Deadline. The Hamilton, Ontario native finds himself on the ice in crucial situations as he is a top-pair penalty killer and is known for his bone crushing hits and shutdown ability. He is a student of the game who shoots well, skates well, and is always working to improve. He picked up the game-winning goal and added an assist in Barrie’s 3-2 victory over Belleville in Game 1 of their OHL 1st round series. Perron, who was taken in the 7th round of last years NHL Entry Draft has shown everyone exactly what the Ottawa Senators scouts saw when they handed GM Bryan Murray their reports last season. The 18-year-old Laval, Quebec native finished second in Huskies scoring with 29 goals and 76 points in 64 games played this season, setting career highs in almost every offensive category. Listed at 5-11, 165 lbs, Perron isn’t the biggest guy on the ice but he has an established defensive game and tons of offensive upside. He is leaned on to play in all situations and can play both center and the wing. He will need to add some bulk in order to make an impact at the next level but with two more seasons of Junior eligibility, he has plenty of time to do so. He currently has 2 goals and 1 assist in 2 playoff games where his Huskies are tied 1-1 with the Val-d’Or Foreurs. The troublesome forward has had many notable incidents thus far in his QMJHL career. The most recent one led to his release by the Rimouski Oceanic. He is the kind of player who gets under his opponents skin, unfortunately his attitude on the ice isn’t much different off of it. The Gatineau, Quebec native has skated for 3 different clubs (Val-d’Or), (Gatineau), and (Rimouski) over the past 3 seasons. 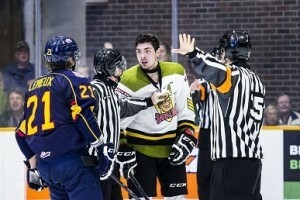 Now 19-years-old, and with his former club in Rimouski taking part in the playoffs, he is on the outside looking in. There is no denying he has the ability to play the game as he has put up 135 points in his past 149 games, but there desperately needs to be an attitude adjustment if he wants to continue on.